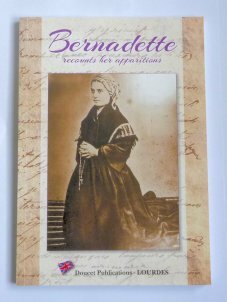 This fascinating 95 page book reproduces historical documents from the period, including handwritten notes by Bernadette herself. The book also contains a reproduction of the autographed manuscript on the Apparitions, photographs of those connected with the events and photos of the Sanctuary of Lourdes. The work as a whole constitutes not only a work of enthralling interest to the reader, but also an indispensable record for the Pilgrim. This is truly a treasure and a valuable addition to your Lourdes library!